Life! My girlfriend Miranda has moved in with me as of February. That’s a first for me. Aside from smashing our houses together, we’ve been improving it as well. We did some minor landscaping work in our backyard. We also just finished up some major landscaping in the front yard with Hill & Valley landscaping. I’ll have to take some proper pictures of it later. I’m a first-time homeowner and this has been my first major home improvement project. Very satisfying. We even bought some stained glass in anticipation of redoing our porch next year with it. We’ve become members at a letterpress shop here in Milwaukee called Bay View Printing Company. Our neighborhood recently had Bay View Gallery Night, in which tons of businesses show art and have little events. 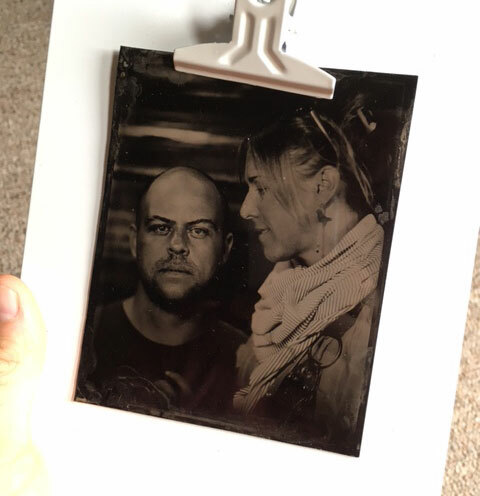 We got a tin type made, how cool is that? Our shop had a show as well, and I decided to show some recent work. My first art show since my BA senior show. Having a letterpress shop where you can go in and use whatever you want is pretty dreamy. Now that the weather is nice, we’ve been camping a lot. Our first outing was camping at a farm in Lake Geneva for a sheep dog trial, which was fascinating and surreal. Last weekend we did the bluegrass festival Blue Ox. This weekend it’s Door County Beer Festival. When you have a camper this cool, you gotta use it! We’ve been growing tomatoes and peppers in a little garden area we made. It’s my first proper garden, I would say, not just some plants I chucked in the ground to see what would happen. Miranda has been brewing kombucha and getting pretty serious about it. I love both the kombucha and the passion. We’ve even been printing some experimental cards for the brand at the letterpress shop. One of my favorite things going lately is crossfit. I go almost every single day to Cream City CrossFit. It’s a lovely little community and a co-op structure. I’d say it’s become a hobby as much as anything.